Crazy Aaron's Twilight 4" Thinking Putty. 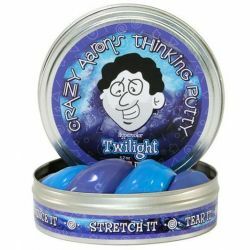 Inspiring songwriters, painters, and poets, the beautiful shades of twilight are also the inspiration behind Twilight Thinking Putty. Twilight is the time of day when the sun sets into dusk.